Katie Jensen received a Bachelor of Science in Psychology from Berry College, but after a number of years in retail management she decided to pursue a more fulfilling career in the health and fitness industry. Katie is a Certified Strength and Conditioning Specialist (CSCS) through the National Strength and Conditioning Association (NSCA) and a Certified Nutrition & Wellness Consultant through the American Fitness Professionals & Associates (AFPA). 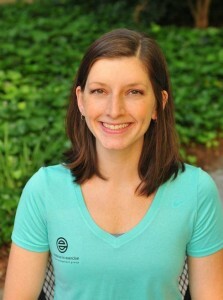 An avid runner and foodie, Katie enjoys helping clients with their overall health through fitness and nutrition. Katie brings a well-balanced approach to her training—work hard in the gym, put good food in your mouth, move your body as much as possible each day and give yourself appropriate rest to be able to lead a healthy and active life. Katie’s Philosophy: There is no magic pill or fountain of youth, so like all good things in life, you will get out of your body what you put into it!